Disclaimer: I have been compensated for this post but all opinions are my own. 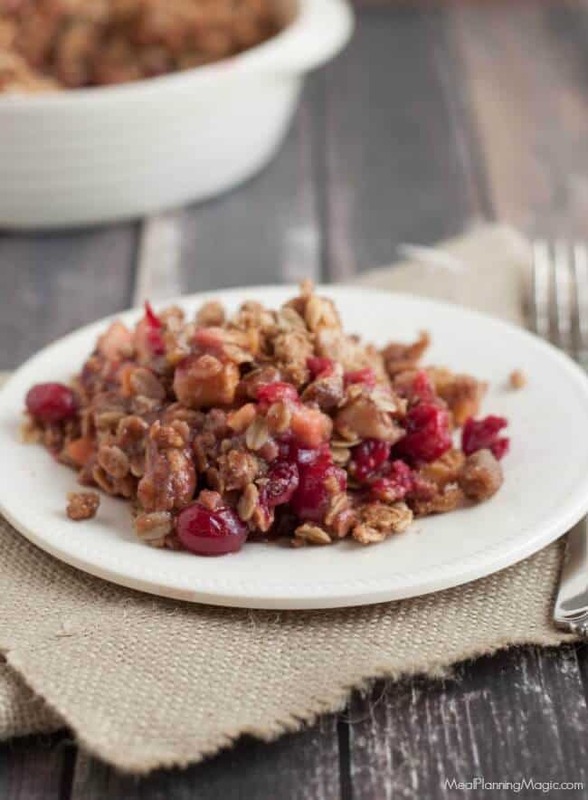 Simple Cranberry Apple Crisp is a healthy, delicious option for your holiday menu–or any time! You can use frozen cranberries to make it year round. 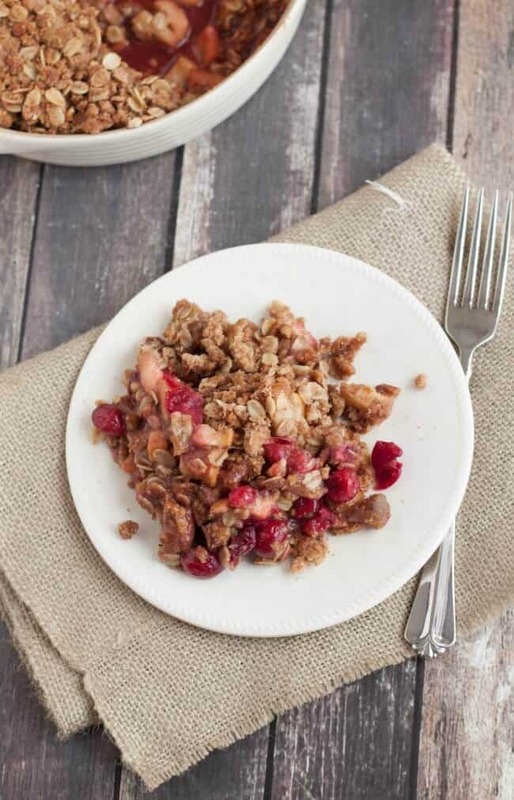 Click here to PIN this Simple Cranberry Apple Crisp to Pinterest. And keep reading to find out how you can help those in need this holiday season with the Produce for Kids Holiday Meal Drive! The holiday season is upon us and I’m busy planning ahead by finding recipes that are healthy yet full of flavor. 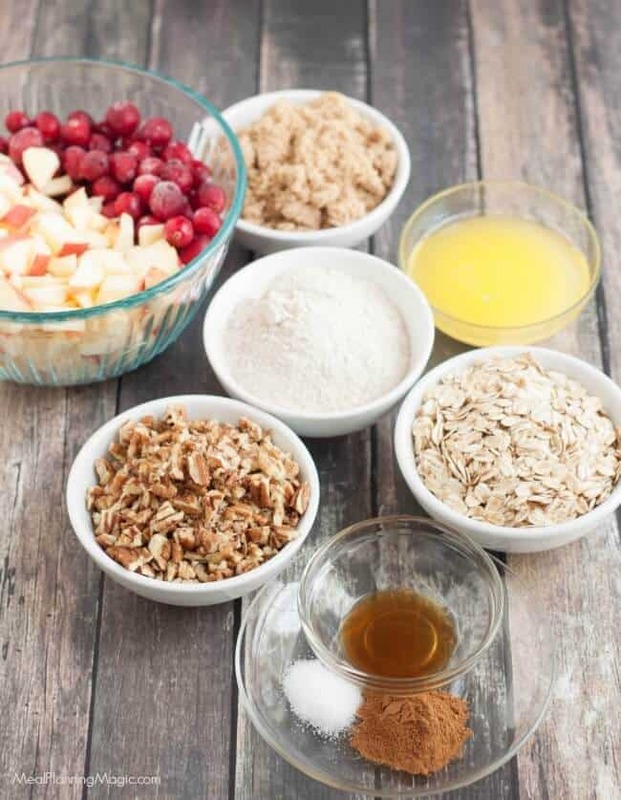 I’ve partnered again with Produce for Kids to share this Simple Cranberry Apple Crisp recipe as a healthy, delicious option for your holiday menu–or any time! You can use frozen cranberries to make it year round. 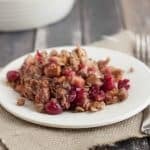 I’m sharing this recipe for Simple Cranberry Apple Crisp (originally shared on the Produce for Kids website) to get you started. Speaking of Produce for Kids, keep reading to find out how YOU can help share a meal with those in need this holiday season through the virtual Holiday Meal Drive they are hosting. Let me tell you, this crisp not only has terrific flavor, it is SUPER easy to put together. I tested it on a weeknight and it was so quick and easy. I love that it is filled with delicious goodness like cranberries, apples, oatmeal and pecans. The pecans give it a great nutty crunch and flavor–something that traditional crisps don’t have. And here’s a little hint, while this is meant to be a dessert, I’m pretty sure it would be a fine breakfast don’t you think? I mean, it’s got fruit, whole grains and nuts. Add some yogurt and wouldn’t that be a yummy morning treat? Cranberry apple crisp is an easy dessert recipe, using fresh seasonal produce! Lightly sweetened apples and tart cranberries, covered with crumbly topping, baked until hot and bubbly. 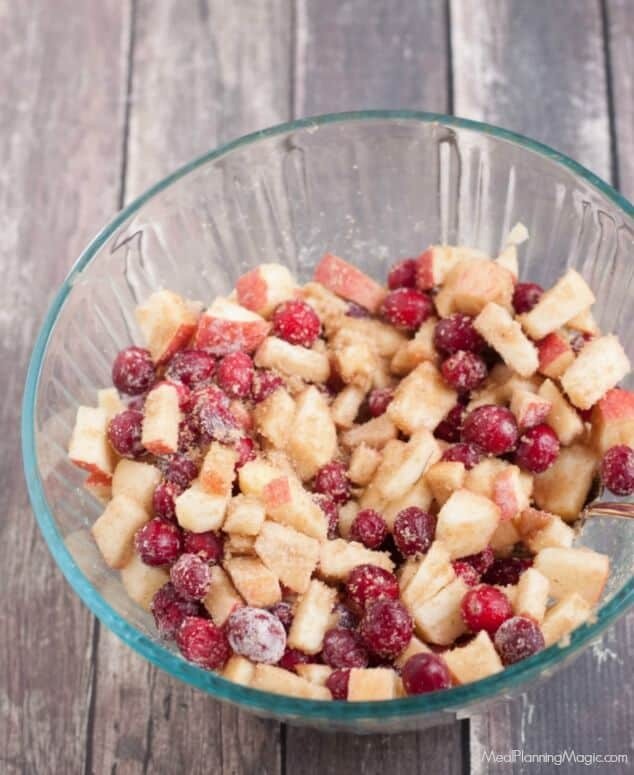 In a medium bowl, combine cranberries, apples, ½ cup sugar and 2 Tbsp. flour in bowl. Pour into greased 8x8-inch baking dish. In a small bowl, combine oats, pecans, ½ cup sugar, ½ cup flour, butter, cinnamon, vanilla and salt in mixing bowl until all ingredients are blended. Sprinkle over fruit. Bake 30-40 minutes, or until topping is lightly browned, mixture is bubbly and apples in middle are tender. Holiday Meal Drive — It’s Easy To Help! Since we had a delayed start to our school year due to Hurricane Harvey hitting our area, I have felt like this school year has been on fast forward mode all year. I’m finally getting my head wrapped around the idea of planning for the holidays. There are so many people not just in my area but in many parts of the country that were affected by natural disasters this year so I’m excited to be partnering once again with Produce For Kids’ Second Annual Holiday Meal Drive. 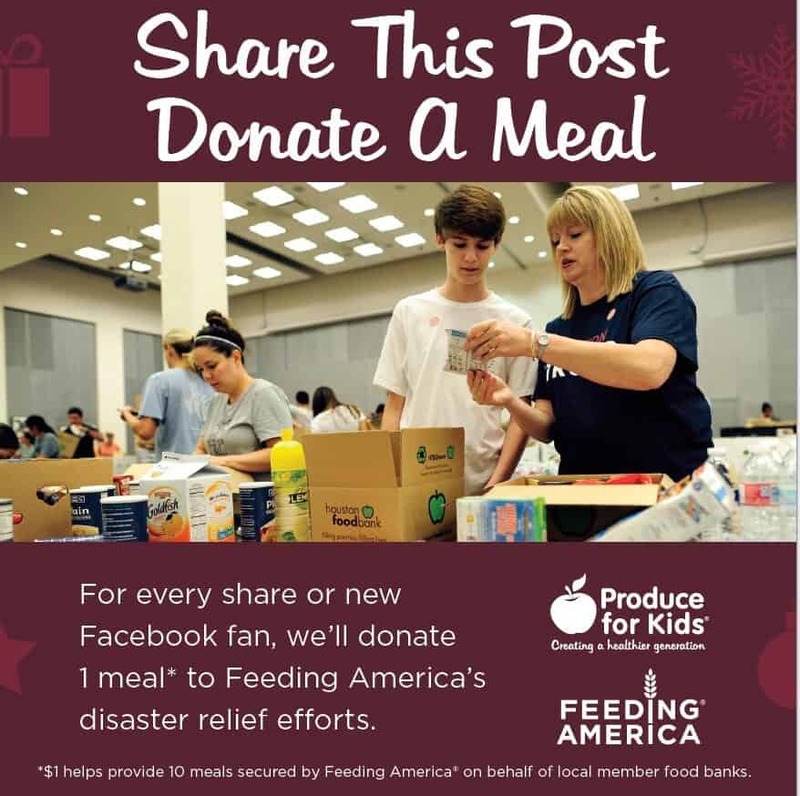 From now through December 31st, Produce for Kids will donate one meal* to aid in Feeding America’s® disaster relief efforts for every share of its Holiday Meal Drive Facebook post and new Produce for Kids Facebook fan. During the the 2016 holiday season, their Holiday Meal Drive helped to secure 15,223 meals for families in need through Feeding America. Wow! That’s a lot of meals for families in need! Click here or on the picture below to support the Holiday Meal Drive on Facebook. In my area, there are still so many people displaced from their homes so the holidays may be a little tougher than usual. That’s why Produce For Kids is also encouraging doing one (or more!) Random Act of Kindness (RAK) this holiday season. The nice thing about RAKs is that they don’t have to cost anything. It can be simply holding the door for someone who has their hands extra full or offering to walk someone’s pet who may not be able to get out as much as they used to or volunteer at a local non-profit in your area. Our RAK started off kind of accidentally. After my son’s recent orthodontist appointment, we swung by a local restaurant to grab some breakfast. When I went to pay, the cashier said the person in front of me had paid for my order! So we decided to pay it forward and pay for the person behind us. I’m not sure how long that chain lasted but that was actually the first time that had happened to me. More recently, when I went to ALDI I brought a handful of quarters. If you shop there, you know that it costs 25 cents to use the grocery cart while you are there. Your quarter is returned to you when you return the cart to the cart collection spot. On this particular day, I decided to fill up a few carts with quarters. It only cost me a few dollars and you never know how much it may have helped someone. Whether those 25 cents mean a lot or just the feeling of not having to hunt for a quarter to use, I hope it brightened a few people’s day. 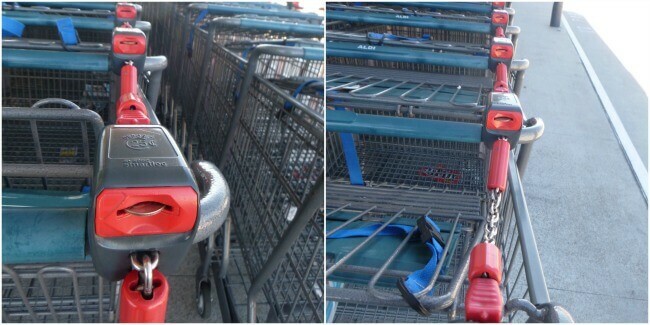 I filled the carts with quarters before I shopped and when I returned my cart, I noticed that a lot more quarters had been left in several other carts behind it. I hope that small act inspired others to spare a quarter with someone else too. What Random Act of Kindess activities will you do this holiday season? Need some more ideas? Check out this list of 100 options online to get you started. Produce for Kids was recently recognized as a Feeding America Mission Partner based on the substantial philanthropic investments Produce for Kids made during the 2016-2017 Fiscal Year. Produce for Kids’ programs have provided more than 7 million meals to families in need through the Feeding America network of 200 food banks and expects to provide 5.5 million meals over the next two years. Meals raised through the Holiday Meal Drive will go to areas affected by recent hurricanes, including Texas, Florida and Puerto Rico, as well as the recent wildfires in California. Through in-store and online programs over the last 15 years, Produce for Kids has donated more than $6 million to charities like Feeding America that benefit families and children. *Each $1 donated to Feeding America provides 10 meals. If you love cranberries like I do, be sure to check out these other recipes using cranberries!